Metal-to-plastic conversions have improved countless applications. Often, consumers reap the benefits of a long fiber product innovation and are completely unaware what role plastics played in the improvement. Not so with Advanced Shoe Technologies’ Safety Toe Caps, where the benefits to the end-user are noticeably apparent. Steel toe boots and shoes have traditionally been deemed an essential piece of safety equipment in many work environments. However, they are heavy to wear and produce increased fatigue. When subjected to high static loads and/or impacts that are beyond the caps’ protection range, steel toe caps can cause serious injury to the wearer’s foot. They can even decapitate the toes necessitating the use of a prosthetic device. In addition, steel toe caps are electrically and thermally conductive making them unsuitable for certain situations and harsh weather conditions. Although plastic materials overcome many of the limitations of steel in footwear, few plastics are tough enough to pass a rigorous set of tests for reinforced shoes established by the American National Standards Institute (ANSI) without increasing wall thickness and thereby enlarging the design. Advanced Shoe Technology found a material solution that surpasses these tests, and created a revolutionary plastic toe cap using an RTP 2300 Series Long Fiber Rigid Thermoplastic Polyurethane. 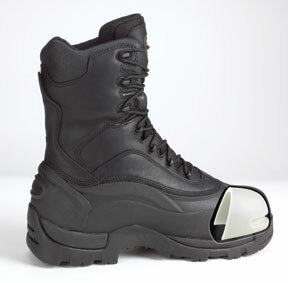 Advanced Shoe Technology’s toe caps can be found in over 30 brands of shoes and boots. Although they are ideal in safety work boots and shoes, their use has greatly expanded into other markets, such as the military and prison industries, because they are lightweight and nonmetallic. They also offer significant benefits to hunters and other outdoor recreation enthusiasts, because they do not conduct cold that can freeze feet. These end-users may not be familiar with long fiber compounds, but what they do know is that they are lighter and warmer on their feet. For more information on Advanced Shoe Technology, Incorporated, call 262-782-6011.